Want to start your child on a path of responsibility? There were days when I thought we were on that path to be more responsible. My little guy would be kind and courteous, and he’d pick things up the first time I asked him to, and I thought I was in heaven. Chores may be an easy first step. Turns out, the little devil was just setting me up. I should have known better, this kid is half me, and I know his father all too well. Any chance of us having an amazingly caring and loving child like you see on TV was a pipe dream. Motivation and responsibility are now at war. Some days motivation is in the form of being screamed at (I know, I’m a horrible parent), some days it could be a decent bribe (he would do just about anything for Lego’s), and other days he only has to be asked about 15 times before something is done. There are lots of screaming back and forth, and the conversation would typically end with AJ yelling “Fine” and throwing his hands up in the air in defeat. Oh yes, I finally won the battle. The war, however, is far from over. This is not a good path to be going down at all. I want to raise a respectful child who knows what it means to earn a dollar. Unfortunately, we spoil the kid. I’ll be the first to admit, I want him to have everything he wants. I’ll also be the first to admit we’ve made a MAJOR mistake in giving in to a lot of the things he wants. AJ’s motivation to do anything relied heavily on what he’ll get out of it instead of doing it because it was his responsibility to do the task. We’ve been changing our ways and trying to teach the value of things that he has, as well as the things that he wants. So began our journey of earning a dollar or two here and there. So I started pinning… like crazy. Everything and anything related to age-appropriate chores my toddler almost preschooler should be capable of doing. He needs to learn what responsibility actually means, and we were doing a horrible job teaching that. Want to follow me on Pinterest? Click here! Want to follow my Toddler Board? Click here! My goal? To make sure he understands that the money Mommy makes every day to pay for the things we need and some of the things we want is earned. I make a lot of sacrifices so that he can have a fun room filled with toys; that his sister can get the support and devices she may need that insurance won’t cover; and his Daddy can go to school and chase his dreams. We were in desperate need to teach AJ the value of the dollar. He wanted to spend money on Lego’s ALL. THE. TIME. He didn’t understand that every time we went to Target, we would spend at a minimum $10. We go to target at least once a week. That $10 at 52 weeks ends up costing me $520 a year. That’s if we get away with only a cheap one. These suckers average in the $20s for small sets. He now has to figure out how much money is in his Spider-man wallet, and we help him figure out costs of different items. What if we get Lego set X and Y, but what if we get set X and Z? So now he knows he has to earn some money to be able to buy Lego’s or candy, or some ridiculous looking toy that I have no idea what it does. But he also knows the disappointment of not having enough money for something he really wanted. Sometimes the lesson’s are harder than others. And yes, my heart breaks a little with his disappointment, and no I don’t get it for him anyway. Ain’t no way this Momma’s teaching him about credit. AJ has some pretty amazing role models in his life, but we were still failing him. He didn’t understand the value of the toys he wanted so badly at the time, and that he ultimately only played with for maybe an entire 3 hours total. Life lessons all around, AJ learned, Mommy and Daddy learned, everyone’s learning! I wanted something simple that I could switch out the tasks as needed, or to just add variety from the more frequent items. A board that had permanently fixed chores didn’t seem the answer, so a printable wasn’t what I was after. I wanted something to hang in his room, and that fit the rustic style we’ve been going towards since we moved in July 2017. Below I’ll walk you through what I did to pull together this nifty little board, and hopefully inspire you to create your own. Feel free to hijack this plan and customize to fit your child and style. Keep in mind that I’m using my Cricut Maker to cut out a stencil in the below template. You may want to pick up a stencil from Michael’s or Amazon so you can easily add on the wording. Want your very own Cricut? 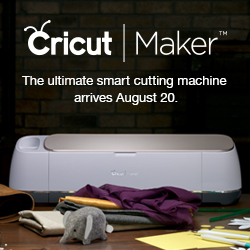 Look no further and check out all that Cricut Maker has to offer here. Just a reminder… If I’ve posted a link to a product, I may earn a commission if you decide to purchase it, at no additional cost to you. Wood Pallet Plaque by Art Minds 17″x11″x.6″ From Michael’s (Not an Affiliate link) Alternatively, a similar item from Amazon can be found here. 631 Vinyl – In a color you don’t like, or if you have a scrap big enough. (It will be used a stencil) If you’re looking for a variety of colors try this grab bag. Alternatively, you can you use stencils, my letters came out to be about 1.5″, these are 2″ and would also fit on the Art Minds 17″x 11″ plaque. White Paint – The lighter the color the better it will show. Magnetic Clips – I got mine at the Dollar Tree for a pack of 4. Card Stock – color of your choice. 1 12″x12″ should do the trick with lots of room to spare. The wooden plaque I purchased from Michael’s was just the right size for what I was looking for and since it was already stained… BONUS! Add the magnetic clips and paint on some words and this is an easy project. My goal here is simplicity. Since I’m a failure at documenting on my first attempts on projects, you’re just going to have to trust me on how easy it was to use Cricut Design Space to pick a font for “AJ’s Chores” and cut it out on my Maker. After you have your wording perfectly aligned and attached, we get to paint! Careful not to go outside the stencil, sponge on white paint (or color of choice). I used a light hand, meaning I wanted it to have a worn look. I let the paint dry a little before slowly peeling off the stencil. Since I didn’t apply much paint, there wasn’t much, if any, bleeding that occurred. Bleeding can occur if you apply a lot of paint and there are gaps where the stencil bubbles up around the edges slightly. To avoid the possibility of bleeding, be cautious around the inside edges to make sure that the stencil is properly attached. Next up, lining up the clips. I used magnetic clips because I bought magnetic clips… by accident. I saw them at the Dollar Tree on a mission for a pool noodle and came out with supplies for two other projects I’ve been wanting to do for a while and no pool noodle. Typical Dollar Tree trip. I was so excited to see these bad boys there, that I didn’t even realize they were magnetic. I had originally planned on using pins I had from another project to adhere to the board but improvised with some E6000 glue that I had on hand. Align the clips, spacing them out evenly. I used a ruler, well actually a yardstick, to evenly mark them out on the board. If you can tell by the picture, I failed miserably. I apparently can’t do basic math. How I’m surviving life is beyond me. I also used WAY to much glue. Once I had them *measured* out, I marked the spots in pencil and drowned those poor magnets in E6000 glue. They will never be separated from their current location… ever. Insert evil laugh here. So, we have our board’s put together. Now onto the nifty cards. Mine are 2″ x 3″ with a cute little design from Design Space. The designs are free with your Cricut Access membership and I’ve shared the project out to use here. I started out with 6 cards, and plan on adding more later as time goes on and AJ’s starting to buy into this program. You can make your own if you have a cool punch all ready to use, or a die cut, go for it. Make this your project! All cut and ready to go, just peel off and you have yourself a complete project. This was really simple, fun and best of all fairly quick, minus the glue drying portion of the festivities. No need to add a wall hanger if you have the Art Minds Plaque, there’s already a twine cord on the back, so this baby is ready for display. Drop me a line in the comments if you have questions or want to share your own creations, I’d love to see your finished products as well. Looking for an additional DIY project, but this time for you? Head over to my fun jewelry organizer/ home decor project! Don’t forget that you can always read our story over on our About page! !